Ah, the Big Mac. For many of us, it's a guilty pleasure, a midnight snack, a weekend treat. While it may taste delicious going down, have you ever really thought about what's going on in your body as you digest your meal? Well lucky for us, the folks over at Fast Food Menu Price have broken down what the Big Mac does to your body. Let's just say...it's not pretty. Pretty terrifying, right? But remember, this is in no ways a world-renowned scientific study...As the site explains, it is purely for entertainment. Certified dietitian nutritionist Lisa Moskovitz, CEO of NewYork Nutrition Group talked with Yahoo Health and explained that the immediate reaction to eating a Big Mac varies from person to person, and the infographic is accurate but "somewhat exaggerated." 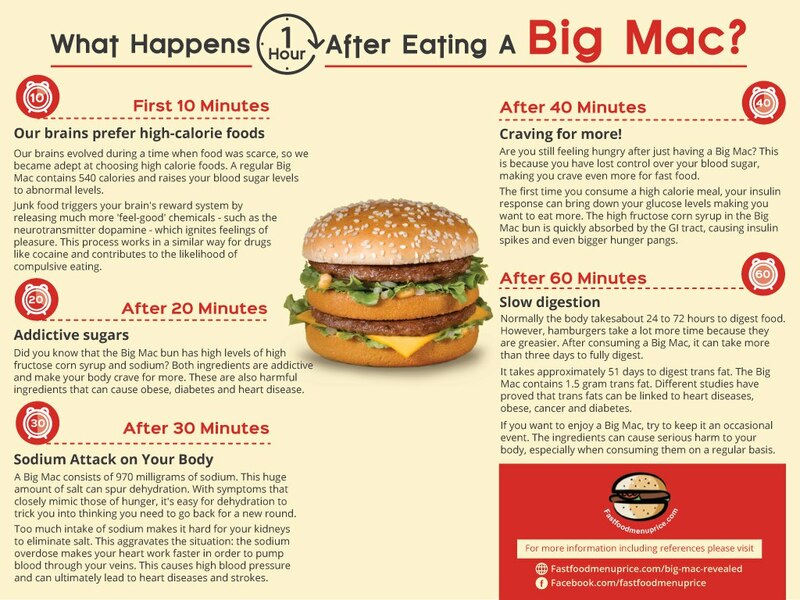 So, whatever the validity of this infographic, you may want to think twice before ordering your next Big Mac. Promo shoot for my new book available 10/7 Grilled oysters. Mmmmmmmmmmmmmmmmm! And the winner of the Most Photogenic Canned Food Competition is...Sweetened Condensed Milk! So gorgeously viscous. 2nd truck visit today was with the @reubentruck This is their namesake! it's officially truffle season at @ottopizzeria !! In #Ohio the most googled Thanksgiving recipe was for Dirt Pudding. See the whole list at NYT Upshot. Amazing bread from the Woodstock at #Kamers today. I'm not letting my sister leave tomorrow because this is what we do when we get together.